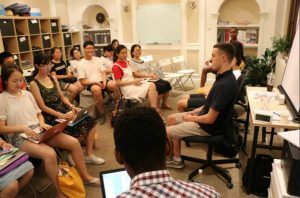 This summer, we were lucky enough to welcome a number of ESC alumni back to the ESC Center for “Alumni Panels”, during which they provided valuable advice and guidance to our current students about application season and life at their respective colleges. It is truly inspiring to witness how much our students grow and mature each year they are away at school! ESC students are fortunate to benefit from the support and guidance of a robust and growing ESC alumni network. At our Top-25 Panel, we were delighted to host Chuck from Rice University, Cecilia from Northwestern University, Lucy from the University of Virginia, and Bill from Emory University. We discussed topics including what to expect during application season, how to create a comprehensive school list, and heard about extracurricular opportunities at the panelists’ respective universities. Our current students especially enjoyed hearing about students’ personal experiences on campus, including typical days, weekend plans, and extracurricular experiences. At our Liberal Arts College Panel, we were joined by Rebecca from Macalester College, Albert from Reed College, and our summer intern Nick from Wesleyan University. We discussed topics including the advantages of a liberal arts college, tips for building relationships with professors, and the residential life experience. Our current students especially enjoyed hearing about our alumni’s favorite classes at their respective schools! At our Ivy League Panel, we welcomed back Abigail from Columbia University and were also joined by our summer intern, Mark from Dartmouth College, to speak on their experiences at Ivy League schools. We discussed topics including navigating first-year, choosing a major, and the impact of class size of alumni’s learning experiences. Our current students especially enjoyed hearing about campus culture at our panelists’ schools. We wish all of our amazing alumni the very best of luck during the new school year. But based on what we observed at our Alumni Panels, we don’t think they’ll need it!